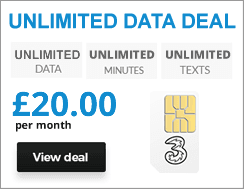 Three’s mobile network is widely available, with network coverage for both 3G and 4G reaching the vast majority of the UK population. Below you’ll see details of exactly how much coverage Three has, along with information on its network speed, how it compares to other networks, how to check your coverage and what to do if you have bad signal. Three’s 4G coverage currently reaches over 99.8% of the UK population, while it also has roughly 98.3% 3G population coverage. The best Three coverage will usually be found in large towns and cities, most of which have strong 4G coverage, while even most rural locations are likely to have some network coverage, though in some cases it could be limited to 3G speeds. But in some cases you’ll actually get better than standard 4G, thanks to a service known as 4G+ (sometimes referred to as LTE-A or LTE-Advanced). Three 4G+ is currently available in cities with high data demands, such as London, Birmingham, Cardiff, Edinburgh and Glasgow. 4G+ on Three improves average data speeds by between 15% and 33%. Three also offers 4G Super Voice (sometimes known as VoLTE), which means you can make calls over 4G. There are a number of advantages to this, but most notably it means Three's voice coverage will reach places it never had before, like indoor blackspots across towns and cities, bringing Three coverage to even more of the UK population. You can check coverage of both 3G and 4G by heading to Three’s coverage checker. Then, simply enter your postcode and it will give you an idea of what both your 4G and 3G coverage is, breaking it down into both indoor and outdoor coverage. This is worth paying attention to, because even if outdoor coverage is good, signal may struggle to penetrate walls in some areas. Three’s coverage checker also includes a coverage map, so you can see the bigger picture and check coverage in nearby towns and cities. As well as widespread coverage, Three also has a number of awards. Roaming seems to be one thing that it consistently wins awards for, having for example won 'Best Network for Roaming' at the uSwitch Mobile Awards in both 2018 and 2017, as well as having won the same award at the Mobile Choice Consumer Awards 2017. It's perhaps no wonder that Three is so well regarded for roaming, given that it's offered free roaming longer than rivals and even now lets you roam across more of the world at no extra cost, but those aren't the only awards Three has won in recent years. Other examples include 'Most Popular Mobile Network' at the 2018 uSwitch Mobile Awards, 'Best Network for Data' at both the uSwitch Mobile Awards and Mobile Choice Consumer Awards in 2017, and 'Best Pay Monthly Network' at the 2017 uSwitch Mobile Awards. Obviously, you’ll have faster speeds using Three’s 4G network than its 3G phone network, around five times faster in fact. Three’s average 4G download speeds stand at 18.78Mbps according to OpenSignal’s Mobile Networks Update from October 2018. The same report put its average latency (the amount of time the network takes to respond to a request) at 48.15ms. Speedtest’s Mobile Speedtest Data Q3-Q4 2017 report on the other hand looks at combined 4G and 3G speeds, with Three averaging a combined download speed of 14.58Mbps and a combined upload speed of 7.35Mbps. That’s competitively fast and should be more than enough for almost any use, from web browsing and social media, to uploading photos, streaming videos and downloading apps. Three’s 4G network uses the 800MHz and 1800MHz bands. The former can travel long distances, meaning it’s great for rural locations where masts and people will be more spread out. And it’s also great at bringing 4G signals indoors, whereas some other frequencies struggle to penetrate walls. 1800MHz is shorter range and not as good at passing through obstacles, but it’s high capacity, so Three can handle a lot of network traffic using it. In areas where you’re limited to 3G, you’ll be using the 2100MHz band. Note that Three also has other spectrum, specifically some in the 3.4GHz and 3.6GHz-3.8GHz bands, but this is currently being reserved for 5G (the next generation of mobile network technology which isn’t yet available). As well as its phone network and mobile data, Three also offers WiFi Calling. This means you can call and text over Wi-Fi, so if you ever have network or signal problems you can still stay in touch with people. WiFi Calling works seamlessly without a separate app on a selection of the latest handsets, with more being added all the time. And if you don’t have WiFi Calling available on your handset there’s also the Three inTouch app, which essentially enables WiFi Calling through an app. When will I have Three 4G in my area? If you don’t currently have any 4G coverage in your area you quite possibly will soon, as Three’s network is continually growing. So we’d suggest regularly returning to Three’s coverage checker to check coverage. The more urban your area the sooner you’re likely to get network coverage, but even rural locations are increasingly getting Three 4G coverage. How can I check the network status in my area? Network status in your area can be seen by using the coverage checker here. Three’s network is constantly undergoing maintenance and upgrades in different areas across the UK. In areas where work is ongoing Three customers may experience disruptions in service, so it’s important to check network status in your area. However, for planned work Three will generally alert existing customers to potential disruptions. What could be affecting my speeds and coverage? A lot of different things can affect speeds and coverage and not all of them will be picked up on even if you check coverage on Three’s coverage checker. Possible problems include walls and other obstacles, temporary structures, your distance from the nearest mast, extreme weather such as flooding or strong winds, planned or unplanned maintenance, and issues with your device or account. Some of these issues are temporary, others are more permanent, but either way there are things you can potentially do to improve your 4G and 3G performance, highlighted below. How can I improve my speeds and coverage? First, you might want to use a speed testing app or site to see just how fast your phone network really is, as well as checking the signal strength. If you’re definitely having a problem, you should try charging your battery if it’s low and doing a software update if it’s not on the latest version, as these can both affect signal strength. You should also check Three’s network status in case there are any outages in your area. Other things to try include turning airplane mode on and off again, turning your device off and on again, ensuring mobile data is on, and resetting your network settings. It can also be worth double checking there hasn’t been a billing issue or failed top-up on your Three account. If all else fails, give Three a call on 333 from your Three phone or 03333 381 001 from any other phone. Can anything be done if I’m in a bad signal area? Three inTouch and Wi-Fi Calling are explained above, but the latter lets you call and text seamlessly over Wi-Fi – so as long as you’re connected to a Wi-Fi network you can stay in touch even without any normal signal. The former is similar, but relies on an app to let you communicate over Wi-Fi, though you still use your normal number. Check out our full guide to improving your Three signal. Yes. Three’s coverage is improving all the time. It already has almost UK-wide 4G and 3G population coverage though. What’s the difference between indoor coverage and outdoor coverage? Outdoor coverage is typically more widespread, since a signal has to pass through walls to provide indoor coverage. So in short if you have outdoor coverage somewhere you may or may not have indoor coverage, while if you have indoor coverage you almost certainly also have outdoor coverage. Since all buildings are different, no coverage checker can say for sure whether you’ll have coverage in a specific building. How can I report a signal problem? Simply head to this page and fill in the short form. Or, if you want support for a signal issue, give Three a call on 333 from your Three phone or 03333 381 001 from any other phone. Does Three control its coverage abroad? No, it partners with local networks and relies on their infrastructure. As such speeds and coverage outside the UK will be variable and largely outside of Three’s control. The good news though is that the network allows you to roam for free in a vast number of locations, with 71 offered if you’re on an Advanced Plan and 49 on an Essential Plan.